What is Direct Metal Laser Sintering? Direct Metal Laser Sintering (DMLS) was developed jointly by Rapid Product Innovations (RPI) and EOS GmbH, starting in 1994, as the first commercial rapid prototyping method to produce metal parts in a single process. With DMLS, 20 micron metal powders free of binder or fluxing agent are completely melted by the scanning of a high power laser beam to build the part with properties of the original metal powder material. 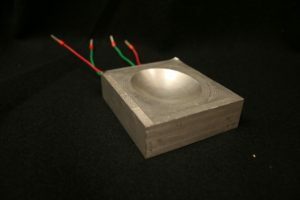 Eliminating the polymer binder avoids the burn-off and infiltration steps, and produces a 95% dense steel part compared to roughly 70% density with Selective Laser Sintering (SLS). You can say that printing in DMLS vs SLS will provide you a higher quality 3D print with a higher density. An additional benefit of the DMLS process compared to SLS is higher detail resolution due to the use of thinner layers, enabled by a smaller powder diameter. This capability allows for more intricate part shapes. Follow Additive News on twitter to join the #AdditiveManufacturing conversation.